May is when morels make their appearance in many areas and harvesting these fruits of nature is what many gourmet chefs and wild edible enthusiasts have long awaited. Morels are technically not mushrooms but they belong to a division called sac fungi which makes it distinctive in flavour and appearance. You may have heard how these fungal delicacies are exquisite in taste yet the reality is that some of them have very little flavour; however it is how they are prepared that makes them mouth-watering. Morels are out in full force in May with some species peaking early in the month and others later. There may be minor adjustments from year-to-year depending on the weather but morels have a reliability factor both for time and location. So where can you find morels? Every year you will find them in the same spots and you’ll find that many people will not divulge their location. So when it comes to finding a stash of morels, you’re pretty much on your own. It takes work locating morels so don’t be disappointed if you go out and get blanked. The usual sites for collecting morels are among maple, poplar, oak, and ash trees where morels happily grow amongst the spring flowers. Look for them on the ground in apple orchards, especially under the drip line of the apple trees, or beside spruce stumps in coniferous woods. They can be spotted on the edges of forested area or they make an appearance from the ground after forest fires. Don’t expect to walk into a forest and expect to find the motherlode of morels; if it were that simply everyone would be out there. If this is your first time out then try an open forest with relatively thin ground cover. Walk slowly and carefully scan the ground; sometimes they are very hard to spot because they are under last year’s leaves (and being similar in colour they can be tricky to spot). A walking stick helps to turn over the leaves and saves your back from undue stress. If you find the motherlode of morels don’t fear overpicking them. The morel is just the fruit of the fungus; the fruit body is supplied by kilometres of tiny fungal filaments called hyphae living in the soil. These filaments can persist in forest soils for generations. Look at collecting morels like apple picking – you pick the fruit but it comes back year-after-year. Morels are hollow and many insects can be found inside them. Always cut the morel down the middle before cooking and be sure to wash them. Some people like to eat morels raw although this is not smart – always cook them before consuming, and never consume wild mushrooms with alcohol. Also, never consume mass quantities of them, always eat in moderation. False morels appear wrinkled (like a brain) rather than honeycombed. If you consume a false morel you may experience wicked gastrointestinal problems. The more common of the false morels is the Beefsteak (Gyromitra esculenta). The head of this species has a brain-like appearance, and its support stalk is short and stout. Hundreds of people have lost their life after eating Gyromitra esculenta because it contains a toxin called monmethylhydrazine – this is a chemical that is in rocket fuel. 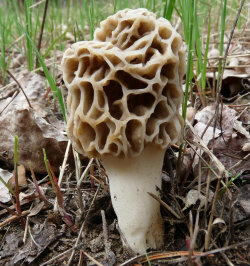 Below are a couple of links to help you identify what morels are edible and what ones to avoid. Never consume a morel or any wild fungi unless it has been identified by a professional. Remember – safety is important so be sure to follow the rules to safe fungi foraging. When I go looking for them I would not eat them right away, I would totally get a second opinion of someone who knows them really well. Apart from that, I think this is a great way to find wonderful food, but most of all, great way to spend time and burn some calories, also spend time in nature. I think doing more activities in nature is part of the fun. It is also cool that you actually took part in the process of getting food on the table.